Get Ready for Co-op Month! The Neighboring Food Co-op Association (NFCA) is ready to celebrate Co-op Month! October is just around the corner, and your Neighboring Food Co- ops across the Northeast will be joining over 40,000 co-ops and credit unions across the United States in celebrating Co-op Month. This year, the National Cooperative Business Association has chosen “Co-operatives See the Future” as the theme for the month, inviting co-op members to work together to make the world a better place, now and for future generations. Stop in at your local food co-op to learn more about the co-op difference. And while you’re there, look for the “Go Co-op” signs on the shelves that identify products that were made by other co-operatives. You may be surprised by what you find, including dairy products from Cabot Creamery Co-op and Organic Valley, fresh produce from Deep Root Organic Co-op, fairly traded coffee, tea, and chocolate from Equal Exchange, beverages from Katalyst Kombucha and Green River Ambrosia, seeds and bulbs from FEDCO, naturally fermented vegetables from Real Pickles, Northeast Grown frozen fruits and vegetables from your Neighboring Food Co-ops — and many others. How will your co-op celebrate Co-op Month? For ideas and resources visit: http://nfca.coop/co-op-month. 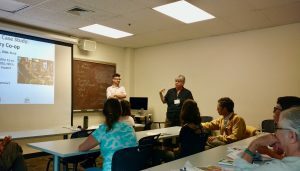 The Neighboring Food Co-op Association (NFCA) sponsored a special track of workshops and presentations, “Co-operatives in the Food System,” at the 44th Annual NOFA Summer Conference, August 10-12, 2018 at Hampshire College in Amherst, MA. The Co-op Track workshops on Saturday, August 11, 2018 – organized in collaboration with the New England Farmers Union and the Valley Alliance of Worker Co-ops – addressed a variety of ways in which co-operative enterprises contribute to a healthy, just and sustainable food system, including practical steps for small producers and co-ops to comply with new food safety rules, the legacy of food co-ops strengthening food security and empowering people to build sustainable food systems, and how to launch a new co-op or convert an existing business to a co-operative. Join Neighboring Food Co-op Association (NFCA) on November 1 – 3, 2018, in Greenfield, MA) for an interactive intensive professional development opportunity focused on leading thinking in co-operative management coupled with tangible examples of how to translate knowledge into action. Participants will include managers and board members from a variety of co-operatives including food co-ops, farmer co-ops, credit unions, and co-operative associations. Who should come? CEOs/General Managers, senior managers, board members and keen employees to join us for this learning and networking event. Goatlet is a combination of 20% raw goats’ milk and 80% raw cow’s milk. It’s based on the award winning Pawlet cheese from Consider Bardwell Farm in Vermont. The goats milk comes directly from the farm and is Animal Welfare Approved while the raw cows milk comes from a select neighboring farm that provides the highest level of grass-fed cheese making milk. Goatlet has notes of a lemon cream pie and recently won 1st place in its category at the 2017 American Cheese Society Conference. This year, Goatlet took 1st place in the American Made/International Style mixed milk category! Consider Bardwell Farm works with Crown Finish Caves, a cheese aging facility in the former lagering tunnels of the Nassau Brewery in Crown Heights, Brooklyn. Thirty feet below the street, the caves were originally designed for fermenting beer and with an average year-round temperature of 50 degrees Fahrenheit, they provide the perfect environment for aging cheese as well. Crown Finish receives “green cheese”, or cheese around one week old that hasn’t developed a rind yet, from local, artisan producers and finishes aging it in the caves. The main tunnel currently holds 28,000 pounds of cheese, and it’s almost full! Goatlet is delicious as a table cheese and notable on any cheese board or try it in a Monte Cristo Sandwich to highlight this delicious cheese. Change of seasons, time to make soup! 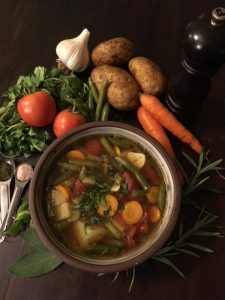 Try this healthy, easy to make recipe that can be prepared in under 45 minutes using frozen veggies grown on Northeast farms from your food co-op! When you purchase the NFCA’s Northeast Grown Frozen Fruits & Vegetables, you are not only making a good decision for yourself and your family, you are help keep our farm families thriving. Our frozen Blueberries, Organic Broccoli, Organic Edamame, Organic Green Beans, and non-GMO Sweet Corn are all produced, picked, processed, and packed right here in the Northeast. Your local food co-op knows how important it is to have thriving regional farms and works hard to support local farmers and offer healthy ingredients for your family. Food co-op shoppers have purchased over 11 tons of Neighboring Food Co-op Association (NFCA) frozen fruits and veggies grown on Northeast farms and available only at your food co-op! The vision of the Neighboring Food Co-op Association (NFCA) is of a thriving co-operative economy, rooted in a healthy, just and sustainable food system and a vibrant community of co-operative enterprise. Eat healthy and help keep our local farms thriving! Look for our Northeast Grown Frozen Fruits and Vegetables in the freezer section. They’re easy to find because they’re packed in a clear package, so you can see what’s inside! For more Farm to Freezer information and recipes visit: www.nfca.coop/farmtofreezer. Amidst an historic decline in net farm income and added disruptions in agricultural trade and biofuel markets, 350 family farmers and ranchers traveled to the nation’s capital earlier this month to meet face-to-face with top Trump administration officials and members of Congress as they decide on a number of legislative and regulatory priorities for family farmers and their communities. NFU Fly-In participants traveled to Washington to push for passage of a Farm Bill that supports family agriculture, strong protections from international trade market disruptions, and expansion of the American grown biofuel market. A delegation from the New England Farmers Union (NEFU) ensured that producers from our region were represented. “Family Farmers and consumers in the Northeast have unique concerns with the Farm Bill,” said Roger Noonan, NEFU President and an organic farmer in New Hampshire. “And it is important to ensure that our voice is heard on issues such as working lands conservation, risk management tools that work for a diverse agriculture, and programs that address the needs of the hungry.” Other NEFU representatives included organic dairy farmer Eric Shaffer of Scheffer’s Grassland Dairy in Hoosick Falls, NY, Carl Shartz of Ten Apple Farm, a diversified family operation in Gray, ME, and organic dairy farmer Mary Castonguay of Castonguay Ayershires of Livermore, ME, which is a member of the Organic Valley co-operative. The three-day event began with a briefing at the U.S. Department of Agriculture (USDA). NFU members heard from USDA Secretary Sonny Perdue, USDA Under Secretary for Marketing and Regulatory Programs Gregory Ibach, USDA Assistant to the Secretary for Rural Development Anne Hazlett, and U.S Trade Representative Chief Agriculture Negotiator Gregg Doud. The event continued with an address by U.S. Senators and Representatives in a Farm Bill Forum. NFU members then took to Capitol Hill to meet in small-group meetings with all 535 congressional offices, and to present congressional champions of family agriculture with the Golden Triangle Award, the group’s highest legislative honor. Recipients of the award from the Northeast included U.S. Senator Kirsten Gillibrand, NY, U.S. Representative Ann Kuster, NH, and U.S. Representative Chellie Pingree, ME.